People’s Choice Community Lottery – FINAL DAYS! 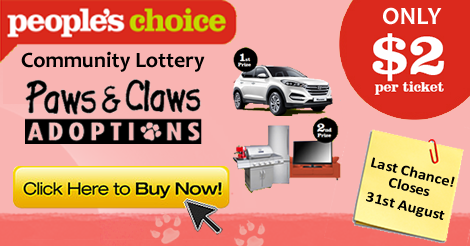 – Paws & Claws Adoptions Inc.
People’s Choice Community Lottery – FINAL DAYS! Paws & Claws Adoptions Inc. is selling raffle tickets as a part of this years People’s Choice Community Lottery. All money raised from the lottery will go towards helping us rescue and rehome more animals and assist us in reopening an adoption centre.